Welcome doctors, medical professionals, clinics, medi-spas, suppliers and brands! 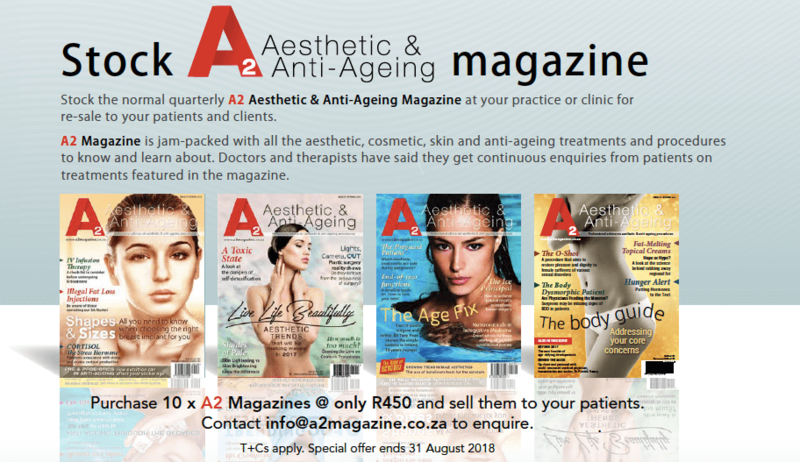 Read the latest A2 Trade Print Magazine – a yearly complimentary print and digital magazine especially for medical and trade professionals in the aesthetic and anti-ageing industry in South Africa. You can expect your next A2 Trade issue in the first quarter of 2017. Read the latest trade articles. And feel welcome to contact us if you have an article you think we should share. We love hearing from you! If you only sign up to one newsletter a month, then remember ours. Sign up to the A2 Trade Newsletter and you will only receive one email a week from us. Your email address will be safe on our subscriber base – we respect your privacy as much as we respect our own. Want to spread the word and market yourself, your clinic or brand? Find out more about advertising with A2 here. Contact us to stock A2 Magazine in your clinic or practice. We’re looking so forward to working with you!